of the annual spring leadership conference April 25-27.
fields at the national HOSA leadership conference at Disney’s Coronado Springs Resort in Orlando, Fl, June 20-13. 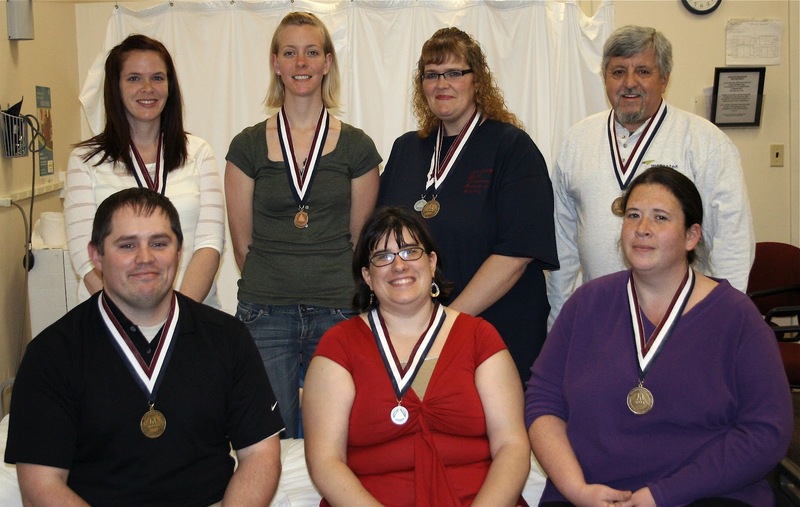 Tina Foster of Lyons claimed a Gold Medal in Clinical Nursing competition, where she had to pass a medical/surgery test, then demonstrate nursing skills to an expert. She also picked up a Silver Medal with partner Darcy Corbett of Canandaigua in the Career Health Display category. Foster and Corbett detailed careers in the medical trauma field, using a three-dimensional diorama and an iPad visual. Meghan Congdon, Palmyra, was also a two-prize winner, scoring a Silver Medal in the Medical Terminology competition, which tested for word roots in several medical disciplines. She also teamed with Jessica Dull, Newark, in winning a Bronze Medal in Medical Health Display. Congdon and Dull presented a diorama on volunteer opportunities for nurses – most of them abroad in the Peace Corps, Hospital Ships and with Doctors without Borders. Dull was also a two-prize winner, earning a Silver Medal in the very challenging Medical Math competition, featuring calculations, conversions, concentrations, solutions and dosages. Erin Brady, Penn Yan, was a Gold Medalist in Medical Math, which used questions that covered pharmacology and medical calculations. John Addyman of Newark was also a Gold Medal winner, winning the Prepared Speech category with a talk on helping others. Tiffany Gantz, Rushville, was the last Gold Medal-winner for WFL/BOCES, commanding the Pharmacology category that featured questions about theory, math and the history of many pharmaceutical drugs. HOSA is a national student organization endorsed by the U.S. Dept. of Education and the Health Science Education Division of the ACTE. HOSA provides a unique program of leadership development, motivation, and recognition exclusively for secondary, postsecondary, adult and collegiate students enrolled in HSE programs. Since its inception in 1976, HOSA has grown steadily reaching nearly 120,000 members through 47 chartered HOSA State Associations and approximately 3,200 secondary and postsecondary/collegiate chapters. 0 Comments to "WFL BOCES NURSING STUDENTS SCORE AWARDS AT STATE CONFERENCE; WILL VIE NATIONALLY NEXT WEEK"